With a sum total of promised investments reaching $1 trillion (estimates vary), the BRI may be the most ambitious scheme of its kind ever attempted – 7 to 8 times larger than the $140 billion Marshall Plan that funded the reconstruction of Europe after the Second World War – and could take decades to fully complete.8 However, it remains Xi’s signature policy venture and key to his legacy as president.9 The initiative is assigned an entire chapter in the Chinese 13th Five-Year Plan (2016-2020)10 and is also codified in the Communist Party’s (CCP) constitution; a sign of its political permanency.11 If successful, BRI could not only instigate unprecedented development in participating states but set the rules and standards that direct economic activity in Eurasia and the Indo-Pacific region for decades to come. This paradigm shift may have significant consequences for the Canadian financial services industry as it increasingly looks to emerging markets in Asia for future growth. Although Beijing may not seek to totally upend the existing international order,12 a Chinese-led economic sphere in Eurasia could test the predominately Anglo-American tradition upon which the international financial system is founded. While banks, investors and insurers look to seize the immense opportunities that the BRI creates, risk managers seeking to adapt to the new policy environment should look to better understand the project and develop flexible governance strategies in response. Although cooperative economic development remains the official goal of the BRI, analysts have speculated that the project could also meet a plethora of tributary objectives. The Belt and Road may deliver various political, economic and monetary benefits to China over a long time horizon. Notwithstanding the potential of these international organizations to scale up investment over time, Beijing has played a clear leadership role in the management of Belt and Road finance thus far through its dedicated state-run investment pool, domestic policy lenders and commercial banks. With $40 billion in authorized capital, the Silk Road Fund operates as a private equity cache supplied primarily by China’s substantial foreign currency reserves and intended specifically to service the BRI.53 First created by the Chinese government in 1994, the national policy banks are designed to meet narrow lending objectives and include the Agricultural Development Bank of China (ADBC), the China Development Bank (CDB) and the Export-Import Bank of China (EXIM).54 The CDB and EXIM in particular are perhaps the most important sources of funding for the Belt and Road.55 Finally, the Chinese commercial banking sector is led by the “Big Four” state-owned houses: The China Construction Bank, Bank of China, Industrial and Commercial Bank of China, and Agricultural Bank of China.56 These institutions are currently raising foreign investment in RMB to supply BRI projects,57 including through bond issuance. In March 2018, the Shanghai Stock Exchange (SSE) and Shenzhen Stock Exchange (SZSE) set forth new regulations for the BRI bond pilot project. The new standards define what kind of securities (by eligible issuer, purpose of funding) can be listed under the new asset category and includes terms and procedure for issuance, expenditure of funds and regulatory reporting, among other considerations.63 The BRI bond market could attract enough capital from abroad to meet the demand that supranational and domestic institutional lenders cannot entirely fill. Nevertheless, the product line could still present some investment risk. Belt and Road denoted securities might not be an optimal funding option either, as bond maturity periods are often shorter than project construction and so repayment is expected before infrastructure assets actually earn any revenue.64 To compliment the fixed-income securities market, there are other possible avenues for foreign investor participation in BRI, including equities trading, infrastructure concessions and auxiliary financial services. Three primary equity classes are available for Chinese-based companies.72 A-Shares are denominated in RMB and are available to both national and QFII certified institutions on the SSE and SZSE.73 Although their face value is in RMB,74 B-Shares are issued in foreign currencies (USD on SSE, HKD on SZSE) and are open to both domestic and international investors.75 H-Shares are issued in Hong Kong, denominated in HKD and openly tradable internationally.76 For corporations based in other participating BRI states, equities may be listed on international exchanges in local or foreign currencies, subject to applicable rules. Private businesses can partner with governments to fund and construct infrastructure through a concessional agreement. In this arrangement, the industry partner provides support for a project, and in exchange is granted the right to profit from its contribution.77 For international financial institutions, the opportunities for concessions or other forms of public-private partnership and the standards governing them along the Belt and Road are as of yet unclear. In its initial phase, the BRI has not been immune to controversy. Its immediate effects and long-term implications, both on the ground in individual countries and across the larger Indo-Pacific, have instilled apprehension and distrust in some regional and international observers. As it continues to evolve, the BRI has the potential to exacerbate existing tensions between Washington and Beijing. The United States has accused the Chinese of seeking “to shape a world antithetical to U.S. values and interests”88 and of forwarding a plan to “target their investments in the developing world to expand influence and gain competitive advantages against the United States.”89 Vice-President Mike Pence has explicitly criticized China for its alleged “debt diplomacy”90 and contrasted the Chinese and American foreign investment approaches, stating that “[w]e don’t drown our partners in a sea of debt. We don’t coerce or compromise your independence.”91 As a response to Chinese lending activities, the U.S. Congress recently authorized the creation of the U.S. International Development Finance Corporation (IDFC).92Beyond the provision of loans, the IDFC can hold ownership stakes in infrastructure assets and offer political risk protection to companies operating in developing countries.93 Seeking to employ local workers and facilitate greater private sector investment, the IDFC can work to avoid the debt trap problem created by the BRI.94 Only $60 billion in funding has been allocated to the organization thus far; China committed an equivalent sum to Africa alone at a September 2017 forum.95 Nevertheless, increased competition between the IDFC and the BRI could thicken the geopolitical climate and contribute to a wider U.S.-China conflict. Perhaps more than 50% of countries hosting Belt and Road projects have credit ratings that fail to meet investment grade.96 In Laos, a Chinese-funded railway link under construction is valued at upwards of half the national GDP,97 while debt servicing accounted for 90% of Sri Lankan state revenue by 2015.98 Leverage to such an extent would imply a significant probability of default under standard lending conditions. Yet in their role as the primary funding source for the BRI thus far,99 state-backed Chinese institutions have demonstrated a risk appetite substantially higher than that of most international investors. Canadian financial service providers issuing loans along the Belt and Road could be exposed to significant credit risk, and find it difficult to realize on the limited range of collateral available to governments in many participating countries. Fixed-income securities and fee-based ancillary services could offer some insulation against nonpayment by subprime borrowers. However, recent prudential actions on the part of highly indebted governments suggest that major defaults are less likely over the long-term. A number of countries have moved to reject or rethink projects due to fiscal concerns: not only Malaysia, but also Pakistan, Sierra Leone, Bangladesh and Myanmar.100 Although more restrained lending could slow the pace of construction and investment, it may also instill greater market confidence and secure a stable source of private financing for the BRI over time. For institutional investors, local and international political risks present a challenge for which management strategies are limited. Project delays or cancellations and physical damage associated with civil or violent action could affect repayment rates on debt instruments like BRI bonds and devalue infrastructure holdings. Strategic competition between rival states can produce regulatory discrepancies, trade disputes or segmented business environments over which private actors have negligible influence. Associations with controversial projects could also pose reputational problems, with implications for financial service providers operating where the Belt and Road faces increasing opposition. However, the introduction of new BRI asset classes that better link specific investments with companies and projects could help financial institutions to more accurately measure their portfolio risk and develop contingency plans for loss-inducing political events. In its effect on standard setting, the BRI could significantly disrupt the working environment for incumbent firms. American and European companies may find it more difficult to commercialize technological innovations in nations where Chinese standards predominate.107 For the Canadian financial industry specifically, the shifting paradigm creates risk when looking to sell services in new consumer markets. Chinese state internet controls challenge Western security standards and privacy laws, and Chinese data localization policies run against liberalized digital information flows in other jurisdictions. Additionally, Chinese commercial law and arbitration procedure may deviate dramatically from common law standards. Canadian institutions operating in states along the Belt and Road may be forced to reconcile their business practices with competing regulatory systems. The BRI remains in its nascent stages and Chinese leaders may have the means to adjust course and correct for the problems encountered in its initial phase. Whether they can totally respond to current and emerging challenges is unclear, although China’s almost unprecedented economic success over the past decade speaks both to Beijing’s policy-making acumen and its determination to succeed. Risk managers should continue to monitor and respond to the underlying threats faced by their enterprises while balancing against the vast opportunities that the Belt and Road may afford to the Canadian financial services industry. 1 Refer to Nadège Rolland, “China’s Belt And Road Initiative: Five Years Later” (Testimony, U.S.-China Economic and Security and Review Commission, Washington D.C., January 25, 2018), https://www.nbr.org/publication/chinas-belt-and-road-initiative-five-years-later/. 1 As argued by Rolland: Refer to Nadège Rolland, moderated by Matthew P. Goodman, China’s Eurasian Century, YouTube Video, 1:02:14, August 2, 2017, https://www.youtube.com/watch?v=DL9XtKDHPGg. Elizabeth C. Economy, The Third Revolution: Xi Jinping And The New Chinese State (Oxford, UK and New York: Oxford University Press, 2018), 193-194. James McBride, “Building The New Silk Road,” Council On Foreign Relations, May 22, 2015, https://www.cfr.org/backgrounder/building-new-silk-road. “About The Silk Road,” UNESCO, accessed December 12, 2018, https://en.unesco.org/silkroad/about-silk-road. For more on the “Community Of Common Destiny,” refer to Refer to Rolland, moderated by Goodman, China’s Eurasian Century. Johnathan E. Hillman, Speaker, China’s Belt And Road At Five, YouTube Video, 4:18:11, October 1, 2018, https://www.youtube.com/watch?v=MbGlcBs-YwQ. As per Xue Li, Chinese Academy of Social Science, quoted in Economy, The Third Revolution: Xi Jinping And The New Chinese State, 194. Brenda Goh and John Ruwitch, “Pressure On As Xi’s ‘Belt And Road’ Enshrined In Chinese Party Charter,” Reuters, October 24, 2017, https://www.reuters.com/article/us-china-congress-silkroad/pressure-on-as-xis-belt-and-road-enshrined-in-chinese-party-charter-idUSKBN1CT1IW. As argued by Rolland: refer to Center for Strategic and International Studies (CSIS), China’s Belt And Road At Five, YouTube Video, 4:18:11, October 1, 2018, https://www.youtube.com/watch?v=MbGlcBs-YwQ. Hillman, Speaker, China’s Belt And Road At Five. Refer to Asit K. Biswas and Cecilia Tortajada, “How New Silk Road Will Cement China As Major Trading Partner For Africa,” The Conversation, August 20, 2018, https://theconversation.com/how-new-silk-road-will-cement-china-as-major-trading-partner-for-africa-100533. 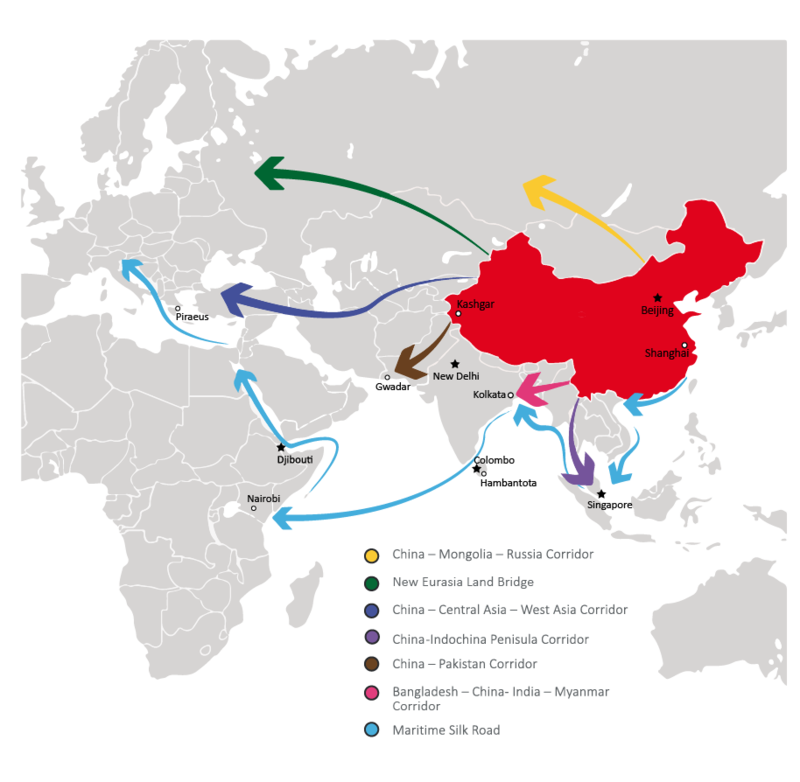 Refer to Andreea Brînză, “Redefining The Belt And Road Initiative,” The Diplomat, March 20, 2018, https://thediplomat.com/2018/03/redefining-the-belt-and-road-initiative/. Enterprise Singapore and Infrastructure Asia, “Collaboration Is Key For The Belt And Road Initiative,” Reuters, November 14, 2018, https://www.reuters.com/sponsored/article/collaboration-is-key-for-the-belt-road-initiative. Jonathan Hillman, “China’s Belt And Road Is Full Of Holes,” CSIS Briefs (September 2018): 3, https://csis-prod.s3.amazonaws.com/s3fs-public/publication/180917_ChinasBelt_final.pdf. Jonathan E. Hillman, How Big Is China’s Belt And Road?” Center for Strategic and International Studies (CSIS), April 3, 2018, https://www.csis.org/analysis/how-big-chinas-belt-and-road. Stewart M. Patrick and Ashley Feng, “Belt And Router: China Aims For Tighter Internet Controls With Digital Silk Road,” Council on Foreign Relations, July 2, 2018, https://www.cfr.org/blog/belt-and-router-china-aims-tighter-internet-controls-digital-silk-road. Trefor Moss, “China’s ‘One Belt, One Road’ Takes To Space,” The Wall Street Journal, December 28, 2016, https://blogs.wsj.com/chinarealtime/2016/12/28/chinas-one-belt-one-road-takes-to-space/. Jane Nakano and William Li, “China Launches The Polar Silk Road,” Center for Strategic and International Studies (CSIS), February 2, 2018, https://www.csis.org/analysis/china-launches-polar-silk-road. Hillman, “China’s Belt And Road Is Full Of Holes,” 1. Cecilia Joy-Pérez and Derek Scissors, “Be Wary Of Spending On the Belt And Road,” American Enterprise Institute (November 2018): 1, http://www.aei.org/publication/be-wary-of-spending-on-the-belt-and-road/. Daniel S. Markey and James West, “Behind China’s Gambit In Pakistan,” Council on Foreign Relations, May 12, 2016, https://www.cfr.org/expert-brief/behind-chinas-gambit-pakistan. Ian Marlow and Dandan Li, “How Asia Fell Out Of Love With China’s Belt And Road Initiative,” BNN Bloomberg, December 10, 2018, https://www.bnnbloomberg.ca/how-asia-fell-out-of-love-with-china-s-belt-and-road-initiative-1.1181199. Refer to www.gov.cn, quoted in Ryan Rutkowski, “Will China Finally Tackle Overcapacity?” Peterson Institute For International Economics, April 22, 2014, https://piie.com/blogs/china-economic-watch/will-china-finally-tackle-overcapacity. China Power Team, “How Will The Belt And Road Initiative Advance China’s Interests?” China Power – Center for Strategic and International Studies (CSIS), last modified September 11, 2017. accessed October 29, 2018, https://chinapower.csis.org/china-belt-and-road-initiative/. Xugang Yu and Cristiano Rizzi, “China And The ‘Belt And Road’ Initiative: What Is It All About?” in China’s Belt And Road: The Initiative And Its Financial Focus, ed. Zheng Yongnian, Kerry Brown, Wang Yiwei and Liu Weidong (Singapore: World Scientific Publishing Co. Pte. Ltd, 2018), 62. The Economist Intelligence Unit, “Renminbi Internationalisation And The BRI: Rebuilding Momentum?” HSBC, April 10, 2018, https://www.business.hsbc.com/china-growth/renminbi-internationalisation-and-the-bri-rebuilding-momentum. China Power Team, “How Much Trade Transits The South China Sea?” China Power – Center for Strategic and International Studies (CSIS), last modified October 27, 2017, accessed December 17, 2018, https://chinapower.csis.org/much-trade-transits-south-china-sea/#easy-footnote-bottom-5-3073. For more on the “Malacca Dilemma”, refer to Ibid. Yu and Rizzi, “China And The ‘Belt And Road’ Initiative: What Is It All About?” 62-63. Miyeon Oh, “How Energy Infrastructure Is Shaping Geopolitics In East Asia,” World Economic Forum, November 2, 2018, https://www.weforum.org/agenda/2018/11/impact-shaping-energy-infrastructure-asian-geopolitics/. As noted by Lampton: refer to David M. Lampton and Bonnie S. Glaser, “One Belt, One Road, One Asia? : A Conversation With David M. Lampton,” May 10, 2017, in China Power, produced by Center for Strategic and International Studies (CSIS), podcast, MP3 audio, 29:40, accessed October 26, 2018, https://chinapower.csis.org/podcasts/one-belt-one-road-one-asia/. Yu and Rizzi, “China And The ‘Belt And Road’ Initiative: What Is It All About?” 59-60. Simeon Djankov, “Chapter 1: The Rationale Behind China’s Belt And Road Initiative,” in “China’s Belt And Road Initiative: Motives, Scope, And Challenges,” ed. Simeon Djankov and Sean Miner, PIIE Briefing 16-2 (March 2016): 7, https://piie.com/system/files/documents/piieb16-2_1.pdf. Refer to Rolland, moderated by Goodman, China’s Eurasian Century. Graham Allison, Destined For War: Can America And China Escape Thucydides Trap?, (Brunswick, Australia and London: Scribe Publications, 2017), 107-109. Mario Tettamanti, “The Second Pillar Of The B&R Initiative Funding: The Private Sector,” in China’s Belt And Road: The Initiative And Its Financial Focus, ed. Zheng Yongnian, Kerry Brown, Wang Yiwei and Liu Weidong (Singapore: World Scientific Publishing Co. Pte. Ltd, 2018), 123-124. “Introduction – Who We Are,” Asia Infrastructure Investment Bank, accessed January 23, 2019, https://www.aiib.org/en/about-aiib/index.html. Miller, China’s Asian Dream: Empire Building Along the New Silk Road, 35-38. “BRICS Bank To Lend Between $2.5-3 Bln In 2017 – China Daily,” Reuters, March 2, 2017, https://www.reuters.com/article/china-brics-bank/brics-bank-to-lend-between-2-5-3-bln-in-2017-china-daily-idUSL3N1GF2J0. Raj M. Desai and James Vreeland, “What The New Bank Of BRICs Is All About,” Brookings, July 17, 2014, https://www.brookings.edu/opinions/what-the-new-bank-of-brics-is-all-about/. Miller, China’s Asian Dream: Empire Building Along the New Silk Road, 41. Caroline Banton, “Introduction To The Chinese Banking System,” Investopedia, last modified January 24, 2019, accessed January 30, 2019, https://www.investopedia.com/articles/economics/11/chinese-banking-system.asp. Refer to Miller, China’s Asian Dream: Empire Building Along the New Silk Road, 41-42. Kane Wu and Julie Zhu, “Exclusive: China’s ‘Big Four’ Banks Raise Billions For Belt And Road Deals – Sources,” Reuters, August 22, 2017, https://www.reuters.com/article/us-ccb-fundraising/exclusive-chinas-big-four-banks-raise-billions-for-belt-and-road-deals-sources-idUSKCN1B20ER. James Kynge, “Beijing Moves To Cement Influence Over World’s Financial Markets,” Financial Times, December 2, 2018, https://www.ft.com/content/521cea38-db5d-11e8-b173-ebef6ab1374a. Susanna Rust, “Canadian Schemes First To Get RQFII Status For Flexible China Access,” IPE, January 15, 2016, https://www.ipe.com/canadian-schemes-first-to-get-rqfii-status-for-flexible-china-access/www.ipe.com/canadian-schemes-first-to-get-rqfii-status-for-flexible-china-access/10011490.fullarticle. Bloomberg News, “China Doubles Foreign Investment Limit In Further Opening,” Bloomberg, last modified January 14, 2019, accessed January 22, 2019, https://www.bloomberg.com/news/articles/2019-01-14/china-doubles-foreign-institutional-investor-quota. “China To Ease Foreign Investment Restrictions On Several More Sectors: Paper,” Reuters, June 18, 2018, https://www.reuters.com/article/us-china-economy-investment/china-to-ease-foreign-investment-restrictions-on-several-more-sectors-paper-idUSKBN1JF04S. Alun John and Samuel Shen, “China Eases QFII Foreign Investment Rules In Boost To Channel Use,” Reuters, June 12, 2018, https://www.reuters.com/article/us-china-investment-qfii/china-eases-qfii-foreign-investment-rules-in-boost-to-channel-use-idUSKBN1J81I1. Jonathan Rogers, “Silk Road Bonds: The Next Big Thing?” Global Finance Magazine, February 7, 2017, https://www.gfmag.com/magazine/february-2017/silk-road-bonds-next-big-thing. Refer to “一带一路”债券，包括以下三类债券：1.“一带一路”沿线国家（地区）政府类机构在本所发行的政府债券；2.“一带一路”沿线国家（地区）的企业及金融机构在本所发行的公司债券；3. 境内外企业在本所发行的，募集资金用于“一带一路”建设的公司债券, http://www.sse.com.cn/lawandrules/sserules/listing/bond/c/c_20180302_4468353.shtml. Dan Maskowitz, “How To Invest In Chinese Bonds,” Investopedia, last modified July 23, 2015, accessed January 21, 2019, https://www.investopedia.com/articles/investing/072315/how-invest-chinese-bonds.asp. “Dim Sum Bond,” Investopedia, last modified March 23, 2018, accessed January 30, 2019, https://www.investopedia.com/terms/d/dim-sum-bond.asp. Helen Wong, “Hong Kong Embraces Its Role For China’s Grand ‘Belt And Road’ Initiative,” HSBC, February 19, 2016, https://www.about.hsbc.com.hk/news-and-media/belt-and-road. Takeshi Kihara, “Belt And Road Offers Path Into China For Foreign Financial Firms,” Nikkei Asian Review, May 18, 2018, https://asia.nikkei.com/Business/Business-Trends/Belt-and-Road-offers-path-into-China-for-foreign-financial-firms. Mark Mobius, “The ABCs Of China’s Share Markets,” CNBC, last updated November 3, 2012, accessed January 22, 2019, https://www.cnbc.com/id/49441597. “A-Shares,” Investopedia, last modified April 30, 2018, accessed January 22, 2019, https://www.investopedia.com/terms/a/a-shares.asp. “B-Shares,” Investopedia, last modified January 4, 2018, accessed January 22, 2019, https://www.investopedia.com/terms/b/b-shares.asp. Refer to “Concessional Contracts – Partnerships Between The Public Sector And A Private Company,” The European Commission, accessed January 22, 2019, http://ec.europa.eu/growth/single-market/public-procurement/rules-implementation/concessions_en. Data Provided by Company Statements, Oxford Economics, FT: Refer to Figure 4, “Embracing The BRI Ecosystem In 2018: Navigating Pitfalls And Seizing Opportunities,” Deloitte Insights, February 12, 2018, https://www2.deloitte.com/insights/us/en/economy/asia-pacific/china-belt-and-road-initiative.html. Martin Arnold, “Western Banks Race To Win China’s Belt And Road Initiative Deals,” Financial Times, February 26, 2018, https://www.ft.com/content/d9fbf8a6-197d-11e8-aaca-4574d7dabfb6. Thomas Hale, “Western Banks Gather To Catch The Chinese Investment Crumbs,” Financial Times, September 25, 2018, https://www.ft.com/content/d076f548-805b-11e8-af48-190d103e32a4. Kadira Pethiyagoda, “What’s Driving China’s New Silk Road, And How Should The West Respond?” Brookings, May 17, 2017, https://www.brookings.edu/blog/order-from-chaos/2017/05/17/whats-driving-chinas-new-silk-road-and-how-should-the-west-respond/. Refer to Sam Parker and Gabrielle Chefitz, “Debtbook Diplomacy: China’s Strategic Leveraging Of Its Newfound Economic Influence And The Consequences For U.S. Foreign Policy,” Belfer Center for Science and International Affairs – Harvard Kennedy School (May 2018): 1, https://www.belfercenter.org/sites/default/files/files/publication/Debtbook%20Diplomacy%20PDF.pdf. Refer to Thomas Fingar, moderated by Markos Kounalakis, World Affairs, Youtube Video, 1:01:55, March 14, 2018, https://www.youtube.com/watch?v=7a0CDbUCrS4. Ian Marlow and Sheridan Prasso, “China’s Empire Of Money Is Reshaping Global Trade - Hambantota, Sri Lanka,” Bloomberg - Bloomberg Markets, August 1, 2018, https://www.bloomberg.com/news/features/2018-08-01/china-s-empire-of-money-is-reshaping-lives-across-new-silk-road. Our Foreign Staff, “China Raises Fears Of ‘New Colonialism’ With $60 Billion Investment Across Africa,” The Telegraph, September 2, 2018, https://www.telegraph.co.uk/news/2018/09/03/china-invest-60-billion-across-continent-raising-fears-new-colonialism/. Christopher Balding, “Why Democracies Are Turning Against Belt And Road,” Foreign Affairs, October 24, 2018, https://www.foreignaffairs.com/articles/china/2018-10-24/why-democracies-are-turning-against-belt-and-road. “National Security Strategy Of The United States Of America,” The White House (December 2017): 25, https://www.whitehouse.gov/wp-content/uploads/2017/12/NSS-Final-12-18-2017-0905-2.pdf. “Remarks By Vice President Pence At The 2018 APEC CEO Summit – Port Moresby, Papua New Guinea,” The White House, November 16, 2018, https://www.whitehouse.gov/briefings-statements/remarks-vice-president-pence-2018-apec-ceo-summit-port-moresby-papua-new-guinea/. Daniel F. Runde and Romina Bandura, “The BUILD Act Has Passed: What’s Next?” Center for Strategic And International Studies (CSIS), October 12, 2018, https://www.csis.org/analysis/build-act-has-passed-whats-next. Patricia Zengerle, “Congress, Eying China, Votes To Overhaul Development Finance,” Reuters, October 3, 2018, https://www.reuters.com/article/us-usa-congress-development/congress-eying-china-votes-to-overhaul-development-finance-idUSKCN1MD2HJ. Nyshka Chandran, “A Proposed US Initiative Aims To Be A ‘Clear Alternative’ To Chinese Investment In Asia,” CNBC, September 7, 2018, https://www.cnbc.com/2018/09/07/us-proposal-aims-to-be-alternative-to-china-investment-in-asia.html. Jane Perlez and Yufan Huang, “Behind China’s $1 Trillion Plan To Shake Up The Economic Order,” The New York Times, May 13, 2017, https://www.nytimes.com/2017/05/13/business/china-railway-one-belt-one-road-1-trillion-plan.html. Peter Janssen, “Land-locked Laos On Track For Controversial China Rail Link,” Nikkei Asian Review, June 24, 2017, https://asia.nikkei.com/Politics/International-Relations/Land-lockedLaos-on-track-for-controversial-China-rail-link, cited in Dylan Gerstel, “It’s A (Debt) Trap! Managing China-IMF Cooperation Across The Belt And Road,” New Perspectives In Foreign Policy 16 (Fall 2018): 12, https://csis-prod.s3.amazonaws.com/s3fs-public/publication/181017_NewPerspectives_FINAL.pdf?aV5pX5jR15O5P0stg7a2nfBYPlmxa7ph. Nyshka Chandran, “Fears Of Excessive Debt Drive More Countries To Cut Down Their Belt And Road Investments,” CNBC, last modified January 18, 2019, accessed January 25, 2019, https://www.cnbc.com/2019/01/18/countries-are-reducing-belt-and-road-investments-over-financing-fears.html. Refer to Lei, The Political Economy Of China’s Belt And Road Initiative, 329-337. Miller, China’s Asian Dream: Empire Building Along the New Silk Road, 166-168. Tettamanti, “The Second Pillar Of The B&R Initiative Funding: The Private Sector,” 128. Nicholas Lingard, John Choong, Robert Kirkness, Kate Apostolova and Xin Liu, “China Establishes International Commercial Courts To Handle Belt And Road Initiative Disputes,” Freshfields Bruckhaus Deringer, https://communications.freshfields.com/SnapshotFiles/30d385d8-07d3-494d-acea-95a37747720b/Subscriber.snapshot. Samm Sacks, “Beijing Wants To Rewrite The Rules Of The Internet,” The Atlantic, June 18, 2018, https://www.theatlantic.com/international/archive/2018/06/zte-huawei-china-trump-trade-cyber/563033/. Andrew Polk, “Quietly, China Is Starting To Set Global Standards: Andrew Polk,” BNN Bloomberg, May 6, 2018, https://www.bnnbloomberg.ca/quietly-china-is-starting-to-set-global-standards-andrew-polk-1.1072270.